I’d almost forgotten how much I loved to hang out the laundry. My sister spent the summer here, helping out with so many household tasks, including washing, hanging out, and folding all the laundry (all I had to do was sort it!). But she went back home when we still had plenty of warm days left. And I must admit, I rather delighted in being able to hang out my own laundry once again. I always find it amusing how very many different ways there are of sorting laundry and hanging clothes on the line. I hang shirts by the hems, my sister hangs them by the shoulders. My mother-in-law can use three clothespins to hang two dishtowels, overlapping the edges, but I quickly learned that on my windy hill that method of hanging out the wash would leave me lacking dishtowels. And the clothespins—I keep them in a basket where they stay clean and dry, while my mother-in-law leaves them on the line regardless of the weather. Clotheslines, sun-dried sheets—there’s something beautiful and even romantic about it all to me. 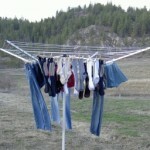 Maybe it’s because I didn’t grow up with a clothesline. 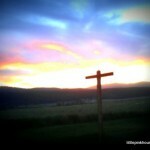 Maybe it’s because I love the peaceful, quiet moments hanging clothes out on the line. 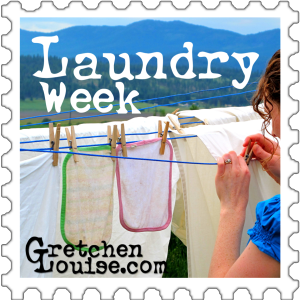 But I love reading and writing about clotheslines and laundry so much that I decided to have a “Laundry Week” here on my blog, in a similar style to the “Apron Week” I had last year. 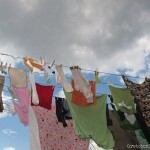 I asked some of my friends who love (and hate) clotheslines to guest post about their own laundry habits, methods, and delights. 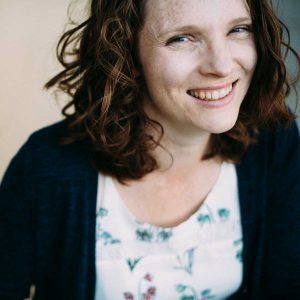 And then I got a few small businesses to sponsor giveaways for all things laundry (but I promise, they won’t send any dirty clothes your way — and you’ll love the prizes, even if you don’t use a clothesline). …got its start when one family was trying to raise money for their adoption. 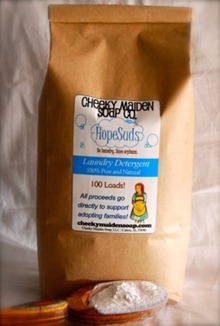 Now, Cheeky Maiden Soap Company is continuing the Hope Suds mission by donating the proceeds from Hope Suds soap purchases to a different adoptive family each month. 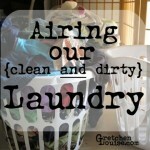 So for each load of laundry you wash, you’re bringing love and a family (and clean clothes!) to an orphan in need. Visit cheekymaidensoap.com for more and enter below to win a 25-load bag of Lavender and Grapefruit Natural Laundry Detergent ($5.99 value). …has a great selection of natural feminine and laundry products. Their “laundry nuts” are the first I’ve tried, but I absolutely love them. You can’t get much more natural than washing your laundry with a nut that produces soapy suds! I forgot to prewash the stains out of one of my shirts when I splattered tomato juice all over it the other day—but as I took it off the line, I realized that The Willow Store laundry nuts had done a good job: I couldn’t find a spot left. Their dryer balls are not only handmade in the U.S., but they help you stay green, even when you have to use the clothes dryer. Just throw a few dryer balls in with the laundry to greatly reduce drying time. 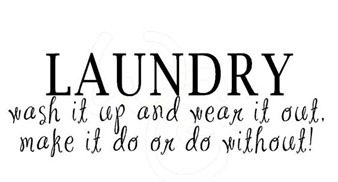 And then try to keep them away from the kids when you’re folding laundry…! 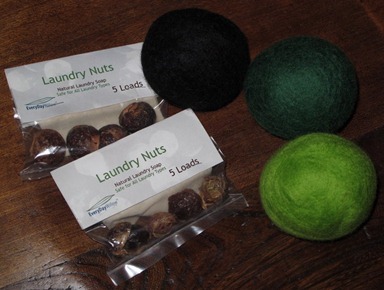 Visit thewillowstore.com to learn more and enter below to win a set of 3 Wool Dryer Balls and a Sample 5 Load Pack of Laundry Nuts ($9.90 total value). 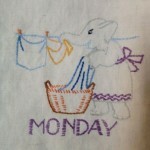 …knows that you have to keep the right perspective on your never-ending laundry pile. Their shop has limitless quotes and sayings for every wall in your house, but of course, some of my favorites are for the laundry room. “Good moms have sticky floors, dirty ovens, messy kitchens, laundry piles, and happy kids.” I am thrilled to pieces to have a daily reminder next to my washer and dryer: “Laundry: Sorting out Life One Load at a Time”. Or there’s the one that always makes my friend Trina laugh: “Laundry Today or Naked Tomorrow.” Wall Graffiti Vinyl does custom orders and sizes, too. Visit their Etsy shop and heart all your favorites, then enter below to win a $20 gift certificate to their Etsy shop (must be redeemed all in one purchase). 5 winners and more than $70 in prizes! I have always wanted to try soap nuts! Thanks for the awesome chance to win. Thank you for participating, Kelly! 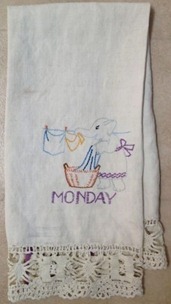 I really enjoyed your “laundry week”! It was so fun, and so many of the posts were inspiring! =) Thank you! I PROMISE I won’t tell Mom. 😉 And I’m so intrigued by those dryer balls! I am excited about this giveaway…I have no choice but to hang my clothes on the line to dry.My dryer broke down well over a year ago.I haven’t missed it too much.Thanks..
Wow, you must have bought quite a supply of laundry nuts to last you that long–that’s amazing! I wanted to guest post for you, but I have too much laundry to do. =P However, it’s possible that I’ll get a moment to post on my own blog. I am excited too! Can’t wait to read and see all the great stuff! Oh, this sounds like a lot of fun! 🙂 We love hanging our laundry outside too. I’d really like to try out the natural detergent or the nuts and dryer balls.